Michell’s new OptiPEAK TDL600 moisture analyser’s fast response and non-contact spectroscopic measurement principle ensures that gas storage companies are able to not only meet demand quickly but also satisfy the contractual standards for moisture content when stored natural gas is withdrawn and injected to the pipeline network. Storing gas is an integral part of the natural gas industry because the timescales for consumption and delivery do not match the time needed to extract, process and transport the gas. In order to ensure an uninterrupted supply to consumers, quantities of gas are usually stored underground, either in depleted gas reservoirs, aquifers or salt caverns. The water dew-point temperature or moisture content of the stored gas is measured during the filling (pressurisation) and usage (de-pressurisation) cycles. Storage pressures of up to 30 MPa require the gas to be very dry in order to prevent condensation occurring. However, the underground storage facilities are used to meet demand in peak periods and are usually non-active during the summer, so there is the potential for the moisture content to rise above acceptable levels during the inactive period. 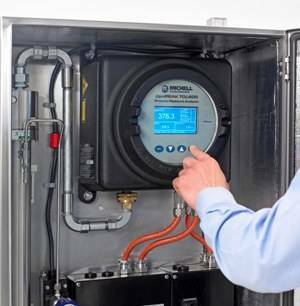 As the gas is needed quickly to meet consumer demands, a fast-responding, reliable hygrometer is vital to be on-hand when gas needs to be taken from storage. Another complication is the tendency of instrumentation to fail when exposed to aggressive compounds and harmful contamination when there is no flow through the analyser. During the inactive periods in gas storage a corrosive, stale sample may sit in the analyser for many weeks. Decommissioning is not an option as little notice will be given for the withdrawal of the stored gas. Michell’s OptiPEAK TDL600 is designed to overcome these pitfalls. Firstly, the tuneable diode laser technology is non-contact. This means that none of the sensing components are subjected to the gas stream and are protected from the aggressive compounds and harmful contamination that would cause failure in other analysers. While this benefit is true for all TDLAS analysers, the OptiPEAK TDL600 also offers a class-leading measurement accuracy of 1ppmV to support the rapid ramp-up in gas supply from the storage facility into the network. This means that it can respond to changes in moisture content in 2 to 3 seconds, allowing fast action to be taken to ensure the continued supply.